Knee pain is one of those things that can be really debilitating. It’s not like a wrist injury that you can carry around—knees are, at least in part, what carry us around. Whether it’s sharp, stabbing pain or a dull gnawing ache, knee pain is never pleasant. Some studies indicate that knee pain may affect more than 46 percent of adults. It can have a highly significant impact on our normal day to day routine and drastically reduce quality of life. One aspect of treating a painful knee which can make a huge difference for many people is a knee brace. A hinged knee brace is a great way of providing instant support to help make the knee feel more usable, less painful and more secure all at the same time. So what exactly is a hinged knee brace, and how does it work? 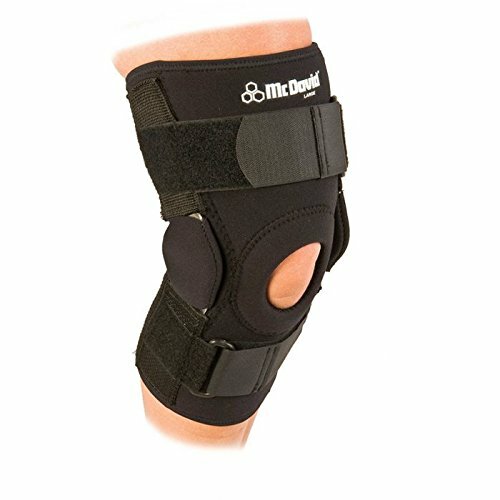 Which one is the best hinged knee brace? Open-patella bicentric hinged knee brace. Bicentric hinged open-patella knee brace. Front closing for easy fit. Open-patella polycentric hinged knee brace. Made from durable neoprene and nylon layers. Internationally recognized class-one medical device. A hinged knee brace is a specific type of knee brace designed to provide support and reduce instability. They usually consist of a suitably rigid frame encircling the leg above and below the knee joint joined from top to bottom by side support bars. Some hinged knee braces consist solely of this frame structure. Other models incorporate specialised support fabric to fit more snugly and comfortably against the skin. The side support bars are often made of metal, and are hinged in the middle. Again, different models vary. Most have a free range of movement as would a normally functioning knee; usually between zero and around 130 degrees. On some models, the degree of movement can be limited to a safe range, and gradually increased as rehabilitation of the knee progresses. However, these are usually used for acute injuries and immediately after knee surgery under the guidance of an orthopedic specialist. The best hinged knee brace will likely feature a bicentric (two point), or polycentric (multiple point) geared hinge system to help control movement whilst also allowing the knee to move normally. What Does a Hinged Knee Brace Do? There are numerous advantages to using a hinged knee brace. In addition to providing some general support and compression, specific compression to the patella, helping to manage swelling and aiding correct movement, hinged knee braces offer additional support and protection for the knee. The lateral, or side, hinges on these kinds of braces provide extra sideways stability, helping to reinforce correct alignment and encouraging normal movement patterns. They also provide the opportunity to limit the range of movement and avoid hyperextension, which can exacerbate many knee problems. This is particularly important for ligament injuries, which can compromise knee stability. Not only can they help to promote good knee function, many people report having less pain when using a hinged knee brace, and find both normal daily activities and exercise much easier. Why Use a Hinged Knee Brace and Who Needs One? 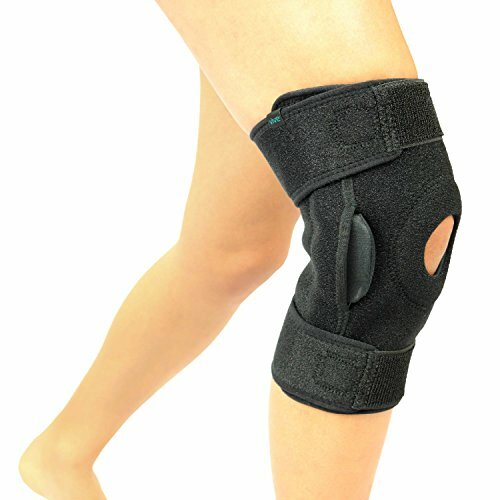 Potentially, anyone who suffers from knee pain or is recovering from a knee injury can find a hinged knee brace useful. While fabric knee sleeves and other types of knee supports can provide compression and help a problematic knee feel better, hinged knee braces offer much more in the way of support. One common reason why people need to use a hinged knee brace is due to potential knee instability related to ligament damage. The knee is actually one of the most complex joints in the body, particularly as it includes two different joints in one—the patellofemoral joint, between the kneecap and the thigh or femur, and the tibiofemoral joint formed by the lower end of the femur and the top of the tibia, or shin bone. As the video shows, the ligaments and meniscal cartilage in the knee are essential. They work together to stabilize the knee, and when one gets damaged and can’t do its job as well as normal, a knee can feel pretty wobbly. Hinged knee braces can be very useful for a variety of different conditions, but they’re not a one-size-fits-all ultimate answer for every type of knee pain. It’s important to follow these guidelines when using a hinged knee brace. Make sure you have a clear diagnosis for your knee pain. Knee braces can support knees without necessarily addressing the cause of the problem. They should be used as part of an overall management program following assessment and explanation from an appropriate medical professional. Although uncommon, it’s possible for the fabric or other component of a knee brace to cause skin irritation or reaction. Keep a close eye on the condition of your skin when using a knee brace. If you notice any abnormality, discontinue use and seek medical advice. Make sure the skin is clean, dry and free of any oils, lotions, creams or gels before fitting the knee brace. These substances can all cause the fabric of a knee brace to deteriorate quicker and make them more difficult to clean. Pay close attention to individual manufacturer’s fitting instructions to get the most out of your knee brace. In particular, follow advice on the duration of periods of use. Unless otherwise specified by a medical professional, knee braces generally shouldn’t be worn at night. Given the huge number of people who sustain knee injuries or have knee pain, it’s not surprising that the choice of knee braces on the market is so vast—there are hundreds of different types around. While choice is often a good thing, it can make it difficult to select the ones that are going to be most effective for you. There’s no need to worry, we’ve got your back, well, more like your knee to be honest! Here are our detailed reviews of five top knee braces to help you choose the best hinged knee brace to suit your individual needs. Mueller is another company with an excellent reputation for producing great-quality braces and supports. Some people found the adjustable and opposing straps at the top and bottom of the brace were effective at achieving a good fit and minimizing downwards slippage of the brace during use, although a few users disagreed, and found a good fit difficult to achieve. Many more users, however, reported that this brace was easy to fit and comfortable to wear for longer periods during the day. People found it particularly useful for patella tracking problems; they felt the design really helped to normalize patellar movement. In general, though, people thought this was a very useful brace that offers excellent value for money compared to other models. Choice of three different sizes. Open rear section for comfort and free movement. Built-in patella buttress for improved patellar tracking. Smooth seams for less skin irritation. A few users weren’t happy with overall fit. Some reported slippage during use. This is quite a neat brace which is adjustable in terms of compression and fit. The hinges can’t be adjusted to limit range of movement, but many people liked the fact they can be removed from the brace as knee rehabilitation progresses and less support is needed. This makes for a very versatile knee brace. Several users commented on the lightweight, breathable fabric, and found it comfortable to wear for longer periods during the day and for exercise. There were very few negative comments about this brace, but one or two people had problems getting the brace to fit them correctly. In general, though, people were very impressed with the quality and good value for money of this brace. One or two people had problems with correct fit. BioSkin is a reputable and trusted brand used and recommended by many medical professionals. The feedback from users was generally very positive; people found this brace easy to fit, comfortable to wear and many were impressed with the neat, low profile design. Several users commented that the brace sat nicely under their normal everyday clothes, and rarely needed adjusting during the day. 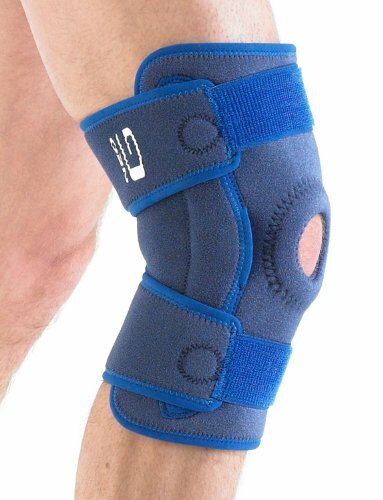 Many people found this brace really helped to control knee swelling, and helped to significantly reduce knee pain. The main negative concern was regarding the price. This brace is a lot more expensive than many other similar models. The majority of people, however, thought that the excellent-quality materials and superior performance of this brace justified the cost. Fits under most normal clothes. Unique strapping system for secure positioning and fit. Choice of five available sizes. Designed for moderate to severe knee instability, this was a very popular knee brace with many users. People found the side hinges provided excellent-quality support, prevented hyperextension and still allowed a generous freedom of movement. Many people commented on how easy it was to fit this brace correctly. Comfortable during exercise and daily activities, with the neoprene providing good compression and a thermogenic effect, many people thought this brace really helped them to use their knee more normally with reduced pain. A few users commented negatively on the high price, but the general consensus was this is a good-quality brace and worth the expense. Breathable rear panel for added comfort. Low profile hinges maximize normal movement. Another popular product from a well-established company that’s the official partner of the U.K’s equivalent of our Physical Therapist Association. This brace is designed to help manage moderate to severe knee problems, and can be used in conjunction with the company’s hot and cold therapy packs, which many people thought was really neat. Several people noticed much reduced knee pain when wearing this brace. Many found it very comfortable and appreciated the non-irritating seams. Many users found this brace very well suited to either use during normal daily life and during vigorous exercise, including skiing, which puts considerable force through the knees. One complaint from a small minority of users was that the seams started to split after some regular use, but this wasn’t a problem for the majority of people. Overall this was considered a very useful knee brace for a fairly reasonable price compared to many other models. Open-patella design with patellar tracking buttress. Compatible with Neo G hot and cold therapy discs. One or two people noticed seams splitting. A good-quality hinged knee brace can prove to be an extremely useful support for a wide variety of different knee problems. They provide compression, keep the area warm, help to control knee stability and limit lateral movement, as well as preventing hyperextension. Of all the braces we reviewed, the product that really shone as the best hinged knee brace for all-round performance and value for money is the Mueller High Performance Hinged Knee Brace. Almost everyone had something good to say about this brace. Most people liked the wraparound design which made the brace easy to fit, and, noting a small number of exceptions, people found it fitted their knee snugly and stayed in position during activity. Many people commented on how secure their knee felt in this brace, and many noticed less pain. Made with good-quality, breathable, microbial fabric by a well-respected manufacturer, several people felt this brace was made to last. Users found it comfortable and low profile enough to wear under most normal clothes, and reported it helped to improve knee function in general daily life and specific sporting activities. All in all, this ticks all the right boxes as the best hinged knee brace.